Join FSL and numerous other community services. This is a Family Caregiver Resource Fair, Wellness Services with free giveaways and helpful reading materials. A day for YOU! 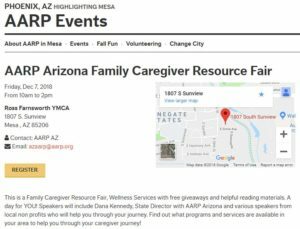 Speakers will include Dana Kennedy, State Director with AARP Arizona and various speakers from local non profits who will help you through your journey. Find out what programs and services are available in your area to help you through your caregiver journey!